Demand for air travel is growing dramatically in Japan, especially in the Tokyo metropolitan area, and Ibaraki Airport has great potential to respond to this growing demand. It is the third airport in the metropolitan area, after the Haneda and Narita airports, and is designed as a secondary airport for Tokyo. 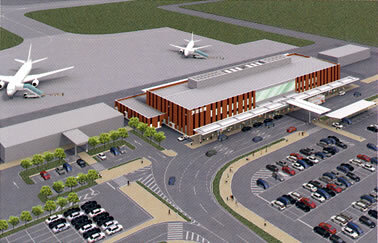 It won the Low-cost Airport of the Year Award from CAPA for its aims and efforts. Skymark Airlines of Japan and Spring Airlines of China currently provide the air flight service in Ibaraki Airport. Ibaraki Airport charges 30% less landing fees than Haneda and Narita as of 2014, and allows airlines to do business at the lowest cost, even though it is also located in the metropolitan area. Among its many advantages, passengers can board a nonstop bus to Tokyo Station for 500 yen ($US 4.20 as of December 2014). Japanese airports typically employ boarding bridges to enable passenger boarding, whereas Ibaraki Airport has adopted a boarding-ramp system which increases the efficiency of aircraft taxiing and passenger transfer. And, as no costs are required for installing and maintaining boarding bridges, airlines do not have to pay usage fees for such bridges. 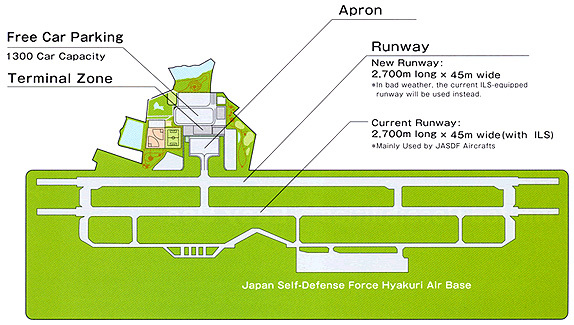 Japanese airports typically have two-story terminal buildings, with the departure lobby on the 2nd floor and the arrival lobby on the 1st, whereas in the Ibaraki Airport terminal building both the departure lobby and arrival lobby are located on the 1st floor. The airport’s terminal building is distinguished by its user-friendly design, with all necessary functions organized for maximum simplicity and efficiency.